The images, courtesy of Dengeki Hobby are just a sampling of the Figma display. 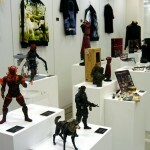 There were many anime themed figures as well. Check out the mirrored images after the jump. The images come courtesy of Game Spark. Read on to check them out. 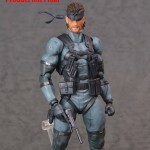 The Figma Blog has been updated with a bunch of photos showing the finalized version of the upcoming Metal Gear Solid 2: Sons of Liberty – Sold Snake Figma Figure.The figure will include multiple faces, moveable yes, assorted weapons, special effects accessories, a cigarette, interchangeable hands, and a cardboard box (which is made of paper). Pre-orders go live starting October 31st in Japan. 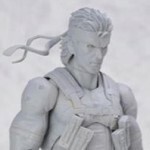 Solid Snake should stand 155MM tall, which is just over 6″. More news out of Tokyo Game Show 2014. Metal Gear Solid has a solid showing, with several Play Arts Kai figures on display at the Konami booth, and a new Figma Snake! Check out shots after the break, courtesy of hobby log. Read on to check out the images, which come courtesy of Tag Hobby. Read on to check out the pics. See the full gallery Here. 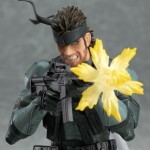 The Good Smile Company has revealed a Metal Gear Solid 2: Sons of Liberty – Sold Snake Figma Figure. Toy People News has posted a few photos of the figure. Right now, we only have a look at the unpainted prototype. Figma series figures usually stand about 155MM tall, which is just over 6″. Also shown was a Solid Snake Nendoroid Figure. 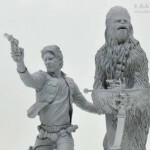 Thanks to Tag Hobby we have our first look at a new line from Revoltech maker Kaiyodo. 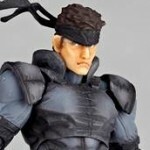 Their Micro Yamaguchi RevolMini line kicks off with RM-001 Solid Snake from Metal Gear Solid. The figure stands at 110MM, which is just over 4″ tall. The figure will feature 15 points of articulation and include moving eyes, interchangeable hands, a pistol with holster, rifle, cigarette, binoculars, anti-personnel landmines and a figure stand. The figure is due out on July 25th at a price of 2,600 Yen, which is about $25 USD. Read on to check out the photos. A new version of Kotobukiya’s Metal Gear Rex has been revealed. They are releasing a black version of their 1/100 Scale Metal Gear Solid – Metal Gear Rex Model Kit. The kit will come with some miniature figures as well. 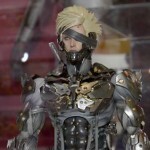 It will include two Solid Snake figures, two Cyborg Ninja figures, and four Liquid Snake figures. Metal Gear Rex will stand over 8.5″ tall. The new versions is due out in June for approximately $80. Read on for all of the photos.